I'm not a birthday person, but ever since I started working, people always wanted to look for an excuse to celebrate something. Cake was a big deal. So I had to leave my beliefs of "no birthdays" aside and "play along". I have to admit I love the attention in my special day. I'd rather have a good cake, something of my taste, than a meaningless gift. I get a lot of those. Stuff that are bought real quick with no meaning at all, like something I aleady have for my bedroom or accessories that are not what I usually wear at all! But its the thought that counts and I appreciate the effort. These gifts are cherished greatly even if I don't need them, its such a shame to give them away. One day I would like to look at them as a good memory. The gift was a mix of things. I would've liked to get a shot of the birthday card, it was such a fun one, something you built, towerlike, and of a layered chocolate cake, I got from Dubai Mall's Kinokuniya. Back to the gift. Ever since Crumbs made created their cute gift boxes, I was dying to get one for myself or get it for someone. I ordered the four sectioned gift box a day ahead. You were free to mix and match anything you wanted from the bakery. I chose a mini cake, milk chocolate cookies, marshmellow & caramel brownies, and chocolate delights. They called to say there were no brownies! So I had to exchange it with cupcake brownies, my second choice. The chocolate delights are so good! Another section of the gift, and the last one I will be mentioning is I got her a gift voucher to Spa Acquatonic. Why? Because ever since the new building opened and everyone has been saying nothing but good stuff about it, shes been on our throats to go. So I thought, why not get her a voucher. I was no gift voucher person at all! But I thought she would really appreciate it. It's located in Crowne Plaza in Farwaniya. Let me say the spa's gorgeous building makes you forget that you're even in Kuwait let alone Farwaniya. It looks like a neo andalusian "Spanish one" castle. It looked perfect last night with the lighting. 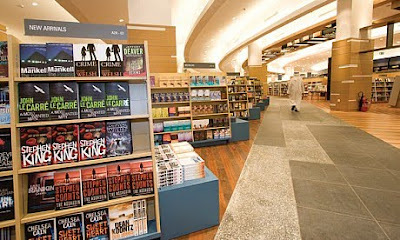 The bookshop loooks huge I think I may have passed by it, not sparing a 2nd glance, just because I hate books hahah. As for the gift box I recieved it twice, it such a sweet gift, once it had 3 cakes ! The spa I'm dying to check, my sister and her gals tried it and say its really good !